KATHMANDU, Jan 6: Amid widespread speculation of massive irregularities in course of holding the recent polls, the election commissioners held a ‘suspicious’ meeting with the heads of two key anti-graft bodies mandated to investigate irregularities, if any, by government entities. 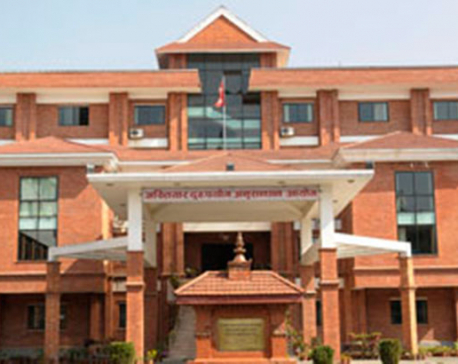 Chief Election Commissioner (CEC) Ayodhee Prasad Yadav invited chief of the Commission for Investigation of Abuse of Authority (CIAA) Deep Basnyat and Auditor General Tanka Mani Sharma at his office on Friday. The meeting continued until late evening. Election officials other than commissioners were not allowed to attend the meeting. “I saw some officials from CIAA and Auditor General’s Office coming to our office. But I couldn’t participate in the meeting as we were told it was totally unofficial gathering,” said a senior election official, requesting anonymity. Election commissioners have been accused of spending money arbitrarily in the polls last year. Unlike in the past, the election body refused aid from foreign donors this time but instead sought massive amount from the government, raising suspicions of intent to misuse funds. Donors used to extend support to EC in kind instead of cash, leaving little room for financial irregularities by the EC. Election commissioners are accused of rejecting foreign fund with a plan to receive billions of rupees from state coffers that they can mobilize as per their own plan. The government had allocated Rs 10 billion for parliamentary and provincial elections. An additional Rs 7 billion was provided to the election body to conduct the local elections. Election commissioners have been accused of misusing funds from state coffers in purchasing logistics such as T-shirts and printing ballot papers and voter rolls. Effectiveness of voter education has been questioned from all quarters after invalid vote percent remained high despite spending huge money for the purpose of educating voters to cast error-free votes. Over Rs 1 billion was spent for voter education, but the invalid vote percentage remained as high as 20 percent under proportional representation category. Embarrassed by the high percentage of invalid votes, the election body didn’t officially announce invalid votes of all three elections till date. Poll observers have questioned the effectiveness of voter education program. Retired election commissioners said officials of the anti-graft body were never invited to the Election Commission in the past. They said inviting heads of anti-graft body ahead of auditing election expenditure, especially when the commission has been accused of being involved in massive financial irregularities, was a totally “suspicious move”. In the past, officials from the Auditor General’s Office used to inquire with election officials only when there were arrears-related issues. Despite multiple attempts to ask about the timing of the meeting, CEC Yadav and other commissioners did not receive any phone call.